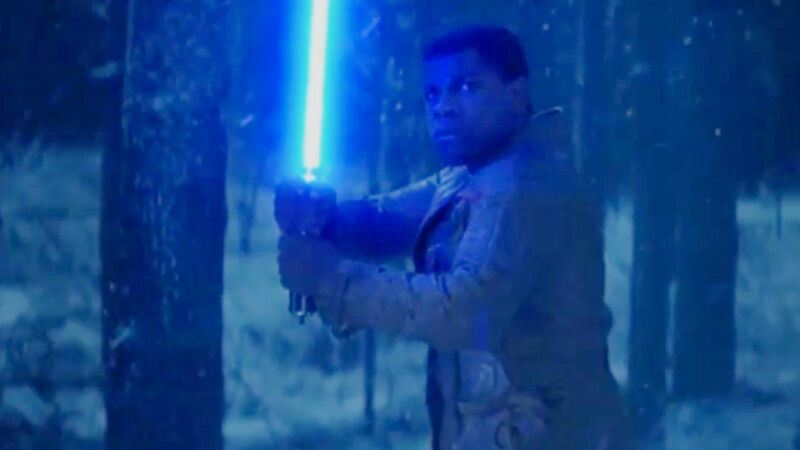 Man, Star Wars: The Force Awakens looks awesome. Yet there is one person missing from the trailer, and from the official poster, that has people talking. The question on every Star Wars fanboy’s lips is: Where is Luke Skywalker? The metal hand kinda gives it away. So yeah, he’s in it, but what will his role be? 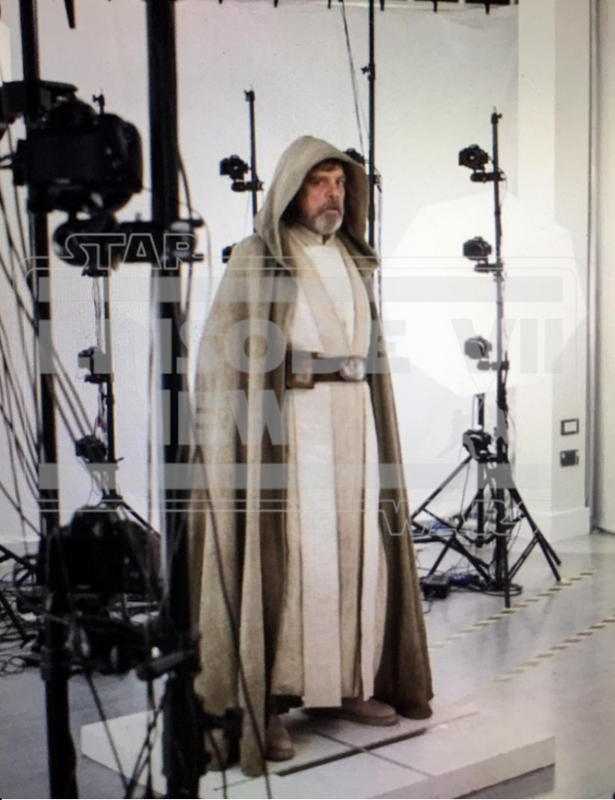 Brace yourselves people… Luke Skywalker is very likely going to die. And this is a good thing, at least in terms of the sequel trilogy (episodes 7,8, and 9) standing on their own feet. But let’s examine the evidence from the trailers, as well as the evidence from good storytelling. Okay, as seen above – Luke is on a volcanic looking planet with ash flying everywhere. It genuinely does not look like a happy place to be. The final trailer also gives us viewers a glimpse of who else visits that planet: namely the Empire (or what’s left of it) led by new main bad guy, Kylo Ren. Definitely looks like the same planet to me. Almost looks like an execution. He is likely stabbing down at someone. So yeah… not good. Yet while Luke’s life is in jeopardy, this actually is a good indicator that The Force Awakens might be the high quality Star Wars film that fans have been waiting for. George Lucas was a big fan of using the setting to enhance the principle intended emotion of a scene. There is no greater example of this than Mustafar from Revenge of the Sith. This planet is hell, a reflection of the dark depths that Anakin Skywalker has sunk to. 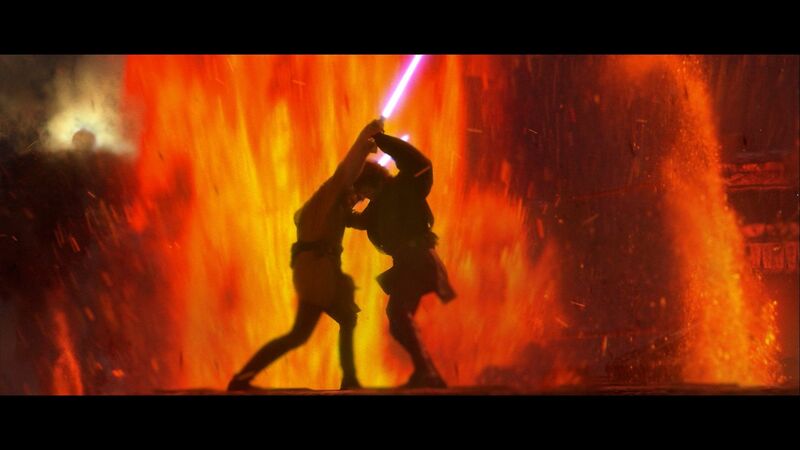 It is here that Anakin Skywalker meets his end, and Darth Vader is truly born. Say what you want about George Lucas, but the man does know about visual storytelling. This new planet looks very similar, yet not as full of rage as Mustafar. It is a grim landscape, but one that is not literally exploding fire and lava every few seconds. This grim certainty may add a powerful element of Luke’s grim acceptance of his fate, and his refusal to fully give in to the anger that destroyed his father. As many have noticed, it is reminiscent of Alec Guinness‘ Obi Wan Kenobi, and I agree. There is a resemblance. Now what happened to Obi Wan in A New Hope? And what happened to Obi Wan’s mentor, Qui Gon Jinn at the start of the prequel trilogy? Man, Darth Vader became a real threat in that moment. He was always intimidating (thanks to great costume design and his ability to telepathically choke the life out of people) but once he kills Obi Wan, the audience knows that the stakes have been raised: characters can die. It was a great example of showing us how dangerous Vader was, rather than Obi Wan being like “he helped the empire hunt down and destroy the Jedi, and he betrayed and murdered your father… maybe.” It always does more to have the villain commit a heinous act on-screen. So now we have Kylo Ren, and if he is going to be our villain for the next three movies – he needs to be dangerous. He’s already cool looking, got that great look going. You know who else was cool looking – Jango Fett, and General Grievous. Yet none of these characters was particularly threatening because they never did anything. Jango Fett was supposed to be a feared bounty hunter, but his battle tactics (fly towards the guy with the sword) left a lot in question. Grevious was the leader of the droid army who stayed alive by… running away for three years? I’m shaking. Of course, those two were helped with by other villains (namely Darth Sidious) who kept the tension high. Now it’s only Kylo Ren… and shiny stormtrooper Captain Phasma. Unless there is a shadowy mastermind waiting to be revealed – the audience needs to hate and fear Kylo. What better and quicker way to establish this by having him kill Luke Skywalker? What’s the greatest problem that shows like Teen Titans and Young Justice had (at least in concept)? They were shows about sidekicks. Batman was always around, Superman was always around. There was this cushion – that existed by just the nature of the main characters – that said: someone else can get it if you fail. Luke Skywalker is currently that someone else. He is the head jedi hauncho, the guy who beat the Empire. Who cares about Rey, Finn, Poe Dameron, and anyone else you’re trying to establish? The audience already knows who the hero is. Han Solo can survive in a supporting role because really – he’s just an old guy with a blaster. Ditto for Chewbacca. Leia might never have really trained to become a jedi (she likely focused more on being a political leader) so she cannot physically hope to overpower Kylo and his baddies. There is still room for these people, while allowing the new characters to occupy the main roles. Time for the new heroes to step up. Time for the force to awaken and the saga to begin again… and probably time for fans to bid a teary goodbye to Luke Skywalker. But no worries, after all – since when does death stop a jedi?